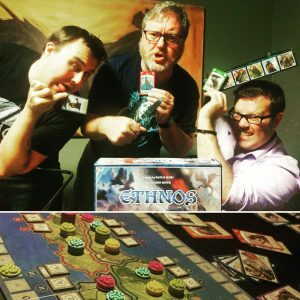 We have finally found a game that none of the Dice Men agree on, as we discuss Ethnos, and why it has caused such a wide range of views amongst gamers. Mark gives us a mega Kickstarter update, as the New Year brings in some awesome game campaigns. We also give YOU a chance to be on air for our upcoming 200th Episode. Ethnos had us fighting over our favourite races and how we felt about the game. We’ll talk about it in episode 198 of the podcast, coming up soon.